Rhythm and blues, lounge, soul. I’m not sure what Shanda & the Howlers do. I just know that it’s FUN and that’s reason enough to give it a listen. Besides, I gather from their Facebook page that they recently played on a bill with Big Sandy & His Fly Rite Boys, an absolutely great rockabilly revival band. And if they’re good enough for Big Sandy, they have to be pretty damn good. Big Sandy was right, of course. And Shanda & The Howlers’ Trouble is both powerful and engaging. “Keep Telling Me” is a great opener and makes it immediately evident that Shandra can REALLY sing. “She Don’t Want a Man” settles into an awesome groove and will remind you of old Motown or Stax recordings. God, how I love the horns here. If David Johanssen‘s alter-ego Buster Poindexter had a sister, ever wonder what she’d sound like? Give “Don’t Need Your Love” a listen. While I typically don’t gravitate toward slower songs, “Born With a Broken Heart” showcases how really great a vocalist Shanda is. This track is killer. Shanda & The Howlers won’t hit the spot with every power pop fan. It’s a sixties revivalist thing and not every song falls neatly into a pop category. But if you like 60’s soul (not unlike last year’s Charley Faye & The Fayettes) and emotive songs executed damn near to perfection, I suggest you give Trouble a listen. I’m surely glad I did. Now there’s only one thing left to do. See them perform live. 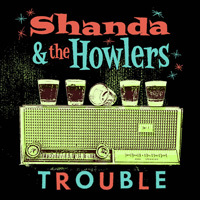 Shanda & The Howlers is available on CD or in digital form from Rum Bar records. GET IT HERE.